Contrary to what some people may argue, making ‘eco’ choices are almost always also thrifty choices. I have provided dozens of examples eco-thrifty decision making in this column over the last eight months. The most recent one last Saturday profiled our daughter Verti’s first Christmas present: a second-hand bicycle trailer spruced up by a local mechanic. Keeping the holiday theme going for another week, I’ll focus on our two eco-thrifty Christmas trees: indoor and outdoor. 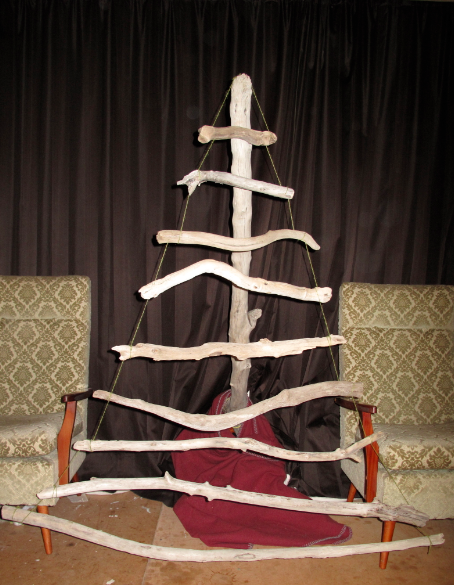 If you are a frequenter of the website Pinterest, you may recognize our Pinterest-inspired driftwood Christmas tree. We walked to the beach from our home just behind Seafront Road, and collected two armfuls of weathered branches. We carried them home, cut them to length, and tied them into a triangle with yarn. Finally, we hung the branches from another piece of driftwood with roots forming a self-supporting base. Oh, and I almost forgot! 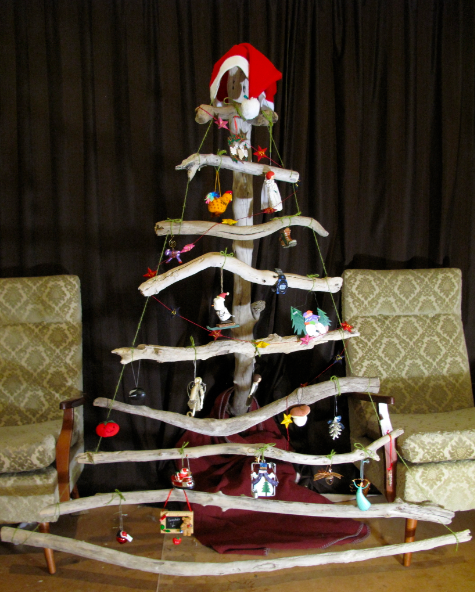 Then we put on Neil Diamond’s Christmas album and decorated our eco-thrifty-beachy tree! I suspect it is easy for anyone to recognize the eco-thriftiness of this tree, although it is probably not to everyone’s aesthetic. That’s perfectly fine. To each their own. But some readers may be surprised that our outdoor Christmas tree – the humble yet effective solar clothes dryer – has been outlawed in many towns and suburbs across America. This is not a joke. But the States are not necessarily known for their eco-ness or thriftiness. Using a washing line rather than an electric dryer is like riding a bicycle instead of driving a car: any way you slice it, the former is always both eco-er and thriftier than the latter. 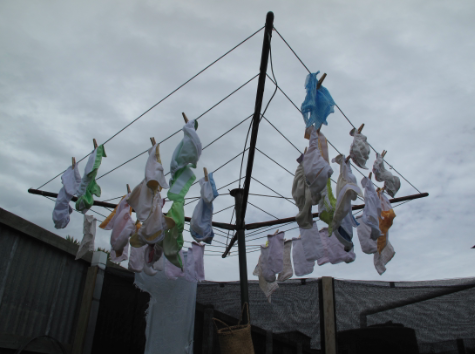 These days, our washing line is decorated with colorful cloth nappies – another example of a choice that is both eco and thrifty. It may be easy to recognize the environmental benefits of cloth diapers, but there are also considerable cost savings over the long run. This brings back the concept of payback period that I’ve written about regarding everything from light bulbs to solar hot water. For a period of two and a half years, the calculated cost of disposable nappies is $2,577 (3,123 NZD) averaging 36 cents (0.44 NZD) per change. By comparison, the following versions of reusable nappies offer the following savings. (Includes washing costs). The website also points out the obvious regarding cloth nappies: they can be used for another child or sold once your bubs is potty trained. Both options increase the potential savings, which build and build over time. Once again we see that the most ecological choice is also the most economical choice in the long term. This is also true for insulating and draft-proofing a home, energy efficient light bulbs, bicycle trailers, laundry lines, and solar hot water. However, all of these things share one or both of the following characteristics: 1) they require an initial investment of funds; 2) they require an ongoing investment of effort. For various reasons, these conditions appear to be significant barriers to many people adopting sustainable behaviors. As a social science researcher, these barriers and potential strategies for overcoming them fascinate me. But that, my friends, is a discussion for another day.